I have made a lot of photo cards over the years, but the photo cards I have made from Tiny Prints are by far the highest quality and best designs. I love when they do these 99 cent promos because you can’t buy a Hallmark card for 99 cents that is of this high-quality and that has a picture on it! My mom loved her Valentine’s Tiny Prints card so much she still has it displayed at home. Moreover, Tiny Prints has tons of designs that don’t have pictures, so if you don’t have photos, you can still make really great designs that aren’t “run of the mill.” I have a whole collection of regular Tiny Prints birthday cards and I love them! Now through April 12, you can make cards for 99 cents using the code MDAY99. 3. Enter the code MDAY99 at check-out and select your home to receive free shipping. 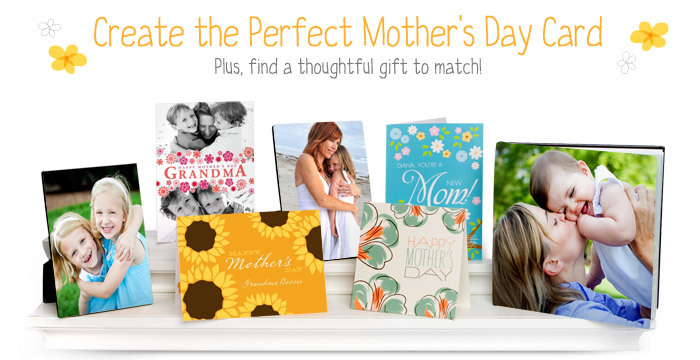 You CAN make multiple Mother’s Day cards at one time (ie: grandma, mom, friends who are expecting, etc.). Each card will be 99 cents. Even though Mother’s Day is a month away, get on the ball and make your Tiny Prints cards now – you only have until Tuesday. Plus, there is no reason to pay $2.99 a card at the store when you can get deals like these. Made one from me and one from the dog all for cheaper than I could have bought a single card in the store. Thanks for the tip!